Properties in Cascina Navacchio Station average 4.6 out of 5 stars. Pescheto - Privat pool villa south of Lucca. Walk to restaurant. Free WIFI. 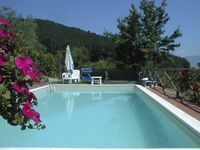 Property 13: Pescheto - Privat pool villa south of Lucca. Walk to restaurant. Free WIFI. Tuscany Heart, between Pisa / Florence / Lucca. Free wi-fi and parking. Property 19: Tuscany Heart, between Pisa / Florence / Lucca. Free wi-fi and parking. 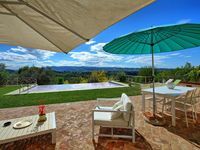 BRAND NEW Casa Maraviglia: "Where Italian design and Tuscan traditions meet"
Property 42: BRAND NEW Casa Maraviglia: "Where Italian design and Tuscan traditions meet"
3 generations of the family spent a relaxing week at the villa. The accommodation was all we hoped for, with bedrooms and bathrooms clean and spacious. We managed to squeeze everyone round the kitchen table for breakfast but it was far more comfortable the day we ate at the large table outside. The water in the pool was colder than we liked ,which was understandable for early April. We enjoyed a special meal on Thursday, cooked by a chef recommended by Fiona. It was a superb evening &amp; we really recommend this experience. The pizza restaurant in the village is great for take away or sit in. We managed visits to Lucca, Pisa, Florence, nature reserves &amp; the beach. The villa helped make it a great week.